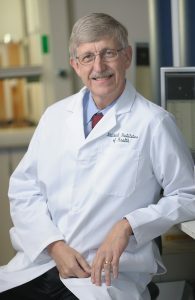 Francis S. Collins, MD, PhD, was appointed the 16th director of the National Institutes of Health (NIH) by President Barack Obama and confirmed by the Senate. He was sworn in on August 17, 2009. On June 6, 2017, President Donald Trump announced his selection of Dr. Collins to continue to serve as the NIH director. In this role, Dr. Collins oversees the work of the largest supporter of biomedical research in the world, spanning the spectrum from basic to clinical research. Collins is a physician-geneticist noted for his landmark discoveries of disease genes and his leadership of the international Human Genome Project, which culminated in April 2003 with the completion of a finished sequence of the human DNA instruction book. He served as director of the National Human Genome Research Institute at NIH from 1993–2008. Before coming to NIH, Collins was a Howard Hughes Medical Institute investigator at the University of Michigan. He earned a BS in chemistry at the University of Virginia in 1970 and a PhD in physical chemistry at Yale University in 1974. While at Yale, however, a course in biochemistry sparked his interest in the molecules that hold the blueprint for life: DNA and RNA. Collins recognized that a revolution was on the horizon in molecular biology and genetics. He changed fields and enrolled in medical school at the University of North Carolina, where he earned an MD in 1977. After joining the University of Michigan in 1984 in a position that would eventually lead to a professorship of internal medicine and human genetics, Collins heightened his reputation as a relentless gene hunter. That gene-hunting approach, which he named “positional cloning,”s developed into a powerful component of modern molecular genetics. He is the author of several books, including The Language of God: A Scientist Presents Evidence for Belief. Collins is an elected member of the National Academy of Medicine and the National Academy of Sciences, was awarded the Presidential Medal of Freedom in November 2007, and received the National Medal of Science in 2009. This conversation took place in Washington, D.C., on December 10, 2017, between Francis Collins, Mark Neuenschwander, and Al Erisman. Mark is a leader in bar-code-enabled medication-use technology. He was a catalyst in moving America’s hospitals to adopt bar-coding at the point of care, and was given a Lifetime Achievement Award in 2010 by the Institute for Safe Medication Practices’ (ISMP) for his work in this area. Today he is a leader and champion for bar-code medication-preparation technology in hospital pharmacy clean rooms. He has participated in many of the health care related Conversations for Ethix, and some of his work was discussed in a previous Technology Watch column. Ethix: What brought you to Washington, D.C., and what are the high-level objectives for the National Institutes of Health (NIH)? Francis Collins: I’ve had the privilege of being the director of NIH for more than eight years. Before that I was the leader of U.S. Human Genome Project, for which NIH was the lead agency for the international consortium that involved 2,400 scientists in six countries. So I’ve been at NIH a long time — 24 years since I walked in the door. The way the NIH director’s job works is to look for exceptional scientific advances that are just beginning to emerge as possible, and seek opportunities to accelerate these results and encourage progress in every way that we can. But let’s be clear: Most of the great talent that makes NIH so remarkable is not sitting next to me in my office. It’s out there in universities and institutes all over the country. These scientific communities have great talent, but they count on NIH to supply the resources. When they believe they have a great idea, they send it to us in the form of a grant application. Then we make sure it gets peer reviewed in an objective, high-quality way, and the best stuff then gets funded. The majority of the science that we do is therefore bottom-up — coming from all of those bright and creative people out there. But there is also a part of what NIH is called to do that wouldn’t happen if we solely depended on those ideas from individual investigators. We also need to look for really big, emerging opportunities that may require bringing new cross-disciplinary teams together, and the requirement for a project manager. We don’t want to miss the opportunity when that happens. You could say the Genome Project was one of those. There would have been no Genome Project without that kind of planning and project management, and we could point to several other similar “Big Science” projects that are going on right now. The human genome project was initiated by NIH? Interestingly, the first proposal for the Genome Project came from the Department of Energy, because they were interested in DNA damage from radiation. They wanted to know how to measure damage, which means you need to be able to look at the human DNA instruction book and understand if it has undergone mutation. So, they raised their hand back in about 1985 or ’86 and said maybe they would do the Genome Project. Well, that got the NIH a little rattled because after all, we were the lead agency for biomedical research. Jim Wyngaarden ultimately was convinced that this was not something to watch, this was something to lead. After a little bit of jousting, NIH and DOE started this together, but NIH became the lead agency. How did you fit in? I was recruited to NIH in 1993. The first director of the Genome Project at NIH was none other than Jim Watson, the same Watson who worked with Francis Crick and discovered the structure of DNA back in 1953. So, 37 years later he was chosen to lead this enterprise. Jim was (and is) the best-known living biomedical scientist. He could open doors and he could convince people in the Congress this was worth doing. He did all of that. And he helped recruit a lot of smart young scientists to believe that this was something they wanted to work on. But he got in trouble fairly quickly because of the lack of much of a governor on his utterances. He offended the NIH director, and he was sacked just 18 months later. Then NIH had to find somebody to step in and do this. So I actually turned down the offer for a little while — but then, after a good deal of thought and prayer, I had to reconsider. I asked myself: “Now, wait a minute. This is only going to happen once in all of human history. It’s not convenient? Are you kidding me?” So I took the leap. I’m glad it was you who did it. It could’ve been somebody else. And it would have been if I had stuck to my “no” answer. But that decision got me to Washington, D.C., and the Human Genome Project turned out to be a wonderful opportunity. Let’s talk about science, and science funding. You mentioned how you send proposals out for peer review. How do you deal with the perceived — at least — bias in peer review? An example from economics that I was reading recently was, economists have been going down this path that assumes that people are rational. But behavioral economists tried to come up with alternate theories recognizing from experiment that people do not make decisions in their own best interest. Their proposals and papers were rejected for a long time before they were finally accepted. I can imagine that happening in the medical field. How do you ferret that out? I think we have the best peer-review system in the world, but it’s certainly not perfect. A peer-review panel brings together experts in the field of a particular set of applications. They are not allowed to have a conflict of interest. That is, they can’t be doing something that’s competitive and it can’t be their best friend whose application they’re reviewing. They gather in a very intense way for a couple of days and every application gets deep dives from two reviewers, while everybody else hears about it, reads the summary, and gets to vote. So, you’re getting input from a substantial group of smart people. But do we always get it right? No. Part of the challenge is that, especially when budgets are tight — and they are right now — peer reviewers tend to get conservative. They tend to be more likely to support something that’s a tried-and-true approach to a problem. Investigators that have made great progress in the past will continue to do so. Thus progress becomes incremental. The really groundbreaking, wacky ideas don’t do as well because of perceived higher risk. There’s not so much preliminary data, maybe this is an investigator who’s just getting started. And the idea was interesting, but it didn’t quite make the cut. That scenario worries me. Our solution to that situation — although it’s not a perfect solution — is to create a whole new set of application mechanisms that you can’t apply to unless you have a wacky idea. And you aren’t expected to have preliminary data, but it has to be an idea which — if turns out be right — is going to be significant. It’s going to really change the way we understand something. And those applications — things like the Pioneer Awards, the New Innovator Awards, the Early Independence Awards, and a couple of others — have turned out be a really wonderful antidote to conservatism. For some of them that we’ve been funding long enough, we can actually evaluate outcomes and show that they do end up with more productivity than the traditional grants. So we’re actually shifting more and more of NIH’s portfolio in the direction of those kinds of applications, and less in the traditional ones where you have to lay out exactly what you’re going to do for the next five years. Do you have any examples of the success of what was perceived to be a wacky idea? Well, a great one in the field of neuroscience is an idea that was developed by a researcher named Karl Deisseroth at Stanford, and funded by Pioneer Award. He wanted to figure out how you could actually turn on a particular neuron or a particular network in the brain. His idea was to insert into the animal (usually a mouse) instructions to make a particular protein, which, when you shine light on it, causes that neuron to fire. This “optogenetics” approach opened up a whole new way to study how the brain works, without having to do destructive lesions. In the old way of assessing function of the brain, you just cut something out or you zapped it. Now you’re activating it, but activating in a very precise way with light. That’s been utterly transformative, and it’s a direct consequence of one of those wacky ideas. You said in setting the agenda you look at the broad range of things coming up and a few ideas coming down. How do you identify something like an opioid crisis? We are very aware of what’s happening in terms of the current medical crises. NIH is a part of the Department of Health and Human Services, with partners at the Center for Disease Control (CDC), the Food and Drug Administration (FDA), the Substance Abuse and Mental Health Services Agency (SAMHSA), the Human Resources and Services Administration (HRSA), and the Centers for Medicare and Medicaid Services (CMS). We need to work closely together, and we are therefore very much in-touch with any trends that are happening in health. We try to pay a lot of attention in terms of how we decide where to spend resources; we need to consider the current burden of disease in this country. That’s not the only criterion, because if it were we’d never work on rare diseases. That would be really bad because we have lots of potential there. NIH is not just one monolithic organization. We have 27 institutes and centers, each with a theme and each led by a really remarkable visionary scientist, many of whom I have recruited over the last eight years. I tried to bring on really excellent people who have the skill to look across the landscape and know what’s coming. One of those institutes is the National Institute on Drug Abuse (NIDA) led by a spectacular scientist, Dr. Nora Volkow, who herself has done a lot of the original research about what happens to the brain, using imaging capabilities, when you’re addicted. Whether it’s opioids, cocaine, or marijuana, she’s worked on all of those. A lot of primary data is hers but now she’s the leader of this enterprise. She’s been telling all of us for several years that the opioid addiction problem is really getting worse and now everybody can see just how much worse it is. As a result, I am spending a lot of my time working with Nora and her colleagues to optimize ways to use the tools of science to address this crisis. You and I had originally planned to meet tomorrow, but that got disrupted by an all-day meeting on opioids, which is why we are meeting on Sunday afternoon instead. We will be bringing together the Food and Drug Administration (FDA), Centers for Medicare and Medicaid Services (CMS), the Health Resources and Services Administration (HRSA), and Substance Abuse and Mental Health Services (SAMHSA — responsible for all treatment programs). We will gather in the headquarters building on the NIH campus, along with the acting secretary of HHS, and address the question: “Are we really all connected in the best way possible?” as we together deal with this crisis. This year and next year, a billion dollars worth of opioid-addiction treatment programs will be supported in all 50 states. Are we learning what we should be from the those? Do we really know what’s working and what isn’t? Do we really know how long somebody needs to stay on treatment before the risk of relapse goes down? There’s a lot we don’t know. And just throwing money at the problem isn’t the answer. You’ve got to have the right information. Furthermore, we need to develop new options for treatments. We need to develop better antidotes for people who’ve overdosed — because some of the new synthetic opioids are so strong that the antidote — Narcan — doesn’t always quite achieve complete reversal. And in the longer term, we’ve got to have new drugs that are not addictive, but are potent for treating pain. We don’t want to abandon those 25 million people in the U.S. who have pain every day, and for whom opioids have clearly not been a good answer. Should we have anticipated some of the downsides of opioids? You can’t go back but what did you learn? Everybody now says we should have anticipated this back in the 1990s, when the medical profession got carried away with this idea that nobody should experience any kind of pain. Pain literally became the fifth vital sign. Health care providers were graded on what their patients said about pain, so everybody got asked about their pain levels in the clinic or the hospital. A typical response might be, “Well, come to think of it, my knee isn’t feeling so good today.” Alongside this emphasis on relieving pain came an incredible amount of marketing dollars, being spent by companies that were making billions of dollars on pain killers. Pretty soon, the United States was consuming 85 percent of all the opioids in the world — although I don’t think the U.S. has 85 percent of the pain in the world. Unfortunately, there was an idea, based on very flimsy data, that oxycontin — which is a slow-acting opioid — was not going to result in addiction for someone in pain, but it did. Eighty percent of the people who are currently addicted started with prescriptions, not with injecting heroin. And now here we are, trying to figure it out. I was in a circle with some really good thought from the American Society of Health-System Pharmacy last week in Orlando. They were talking about how the opioid crisis came about. Everyone was talking about the use of pain scales that dominate care today. We’re so good at this, aren’t we? Regrettably, the pendulum often swings wildly from one direction to the other. We do want to control pain, but we must be careful of the consequences. For NIH, our goal right now is to find better solutions for chronic pain, and also finding the best solutions to addiction and overdose. What about using DNA in treating disease. You hinted about this in your book The Language of God. Yes, that book is 10 years old. It’s time for a new edition, if I just had time. Let me ask specifically about glioblastoma, since my brother died of this. Is there anything hopeful on the scene with genetics? There is. Right now, we are helping take care of Sen. John McCain at NIH. This is a disorder which is afflicting a lot of people. The hope — and we still have a ways to go to see how whether it can work for glioblastoma — is activating the immune system to recognize cancer that the cellular scouts have somehow failed to see. Many scientists would agree that this is the most exciting thing going on right now in cancer treatment. For some conditions like melanoma — that horrendously malignant skin cancer that has taken far too many young lives — immunotherapy is now working amazingly well, even for people who already have metastatic disease that has spread widely in the body. The trick is to figure out how that cancer has hidden itself from the immune system, and then take the scales off the eyes of those immune cells so that they can see it. Remember Jimmy Carter announcing a couple of years ago that he had melanoma metastatic to his brain? Everybody said, “Well, that’s it.” But he was treated with one of the “check-point inhibitors” that unleashed the immune system to find and destroy those cancer cells. And as far as I know he’s fine, cured of something that we used to consider a sure and certain death sentence: metastatic disease to the brain. The same thing is happening with leukemias. We were doing well already with childhood leukemia — but we’re now doing really well with immunotherapy for resistant leukemias and lymphomas. Success stories are mounting also for some kinds of lung cancers and kidney cancers — though not yet for glioblastoma except in a few cases. A trial we’re running at NIH is focused on that right now. One of the patients in that trial is a long-term family friend from Michigan. She’s now three and a half years out from her diagnosis with no further progression. She had surgery and radiation after her original diagnosis, which left her with some deficits, but those deficits have not progressed. Three-and-a-half years for glioblastoma is way out on the edge of what you normally see. Did the surgery and radiation play a role in preserving her, as well? I assume they debulked a lot of the bad stuff, but that wouldn’t stabilize the disease. That raises another important question. At what point is it “playing God” to keep someone alive without a quality of life? Atul Gawande’s book Being Mortal takes us to the question of death. The medieval church had a whole catechism for dying that included helping people make peace with loved ones and accepting death. My brother was never the same after his surgery. It forced me to wonder about this. I know Atul Gawande well, and his book was a valuable contribution. The same question came up with my friend. She’s never been herself since the surgery and the radiation, but she’s alive. I don’t know how to balance those things off. Her husband thinks it’s great that she’s alive, and I can’t argue with that. How does NIH connect with the pharmacies and the drug manufacturers, which seems to be a part of this challenge? There is an NIH center that I started called the National Center for Advancing Translational Sciences — NCATS. They have the largest collection of pharmacologists and medicinal chemists in any part of NIH. They are helping us build partnerships with industry so that it’s not, “They’re over there and we’re over here,” but rather the goal is to find a pre-competitive space in the middle where we could both get involved. This week on Tuesday and Wednesday, I will spend all day with high-level representatives of 33 companies, including large pharmaceutical companies and some biotechs. We’re gathering to talk about opioids and what can we do to accelerate the path of developing alternatives to opioids for people who have chronic pain and need something better than what they have now. Perhaps this would be a place to ask a related question about the connection between genomics and pharmaceuticals. We have pharmacokinetics, we have pharmacoeconomics now, I don’t know if I’m making up the term, what about pharmacogenetics? If you have certain structure, we know that you would better respond to this drug than you would that one, or maybe you would respond to less than this. Will this make prescribing drugs more complex? I appreciate that, but here is my question. When we have a standardized dose and standardized manufacturing from pharma, then we can get it from the manufacturer all the way to the bedside and it’s untouched — and that’s ideal. But if we get more precise, there’s going to be more alteration or compounding or manipulation of the drug in the process. Is it safe to say that we’re going to be doing more of that in the hospital, because of the pharmacogenetics, as we tailor the dose to the person? It’s a good question. I use the term pharmacogenomics now because it’s not just about one gene, but the whole genome. In general, I don’t think the evidence you get would be so precise that it will require a second decimal level tuning of the dose. But sometimes that can be the case. If you have a blood clot and you’re on this drug that’s been around for decades called warfarin — sometimes called Coumadin — we know that’s a dangerous drug because there’s a very small space between not enough and too much. If you are taking this drug, you have to have your blood tested every couple of weeks, to see if you’re in that sweet spot. But even this didn’t require doing anything very precise about compounding. Basically, that warfarin pill comes as 1 milligram, or 2 or 5 or 10, and you just figure out what’s the right dose for that person, and how frequently they should take it. Nobody had to manufacture new pills. You’ve been talking a lot about things for disease and for corrections and for sickness. Do you think about wellness? Absolutely, this is a great question, and something that I fear we have actually not paid enough attention to. Most research projects have focused on recruiting participants who have a disease — such as diabetes or cancer. And we haven’t learned as much as we should about the people who are doing well and how they are doing well. What could we glean from them that would help other people have that same experience? We’re changing that. So here is another project that I am now deeply engaged in and excited about. It has been a personal dream for 15 years. This program is called All of Us. It is in a test phase right now, but it will get launched this spring. The goal is to enroll one million Americans — the largest study ever contemplated — to understand health and illness. We expect a lot of these are going to be healthy people. All of Us is intended to include very diverse sort of a cross-section of the country: diverse geographically, ethnically, gender, age, socioeconomic status. We asked them to be our partners and to make their electronic health records available. They will have blood samples taken, which can be used for a variety of analyses including their complete DNA sequence. Many of them will walk around with all sorts of wearable sensors like the Fitbit and the Apple Watch — which I happen to be wearing today — and those will keep track of what’s happening to them, including environmental exposures. They will write down sort of all kinds of things in their diaries about what’s happened each day. And they will have ownership of a program that is an unprecedented national opportunity to find out what it is that keeps us healthy or causes us to get sick. And all that data will be in a cloud-based format — de-identified — so that any qualified researcher has a chance to figure out what it all means. This is going to be an enormous data set and you don’t want just the people who are running the study to have access to it — you want everybody who has a great idea about how the data can point to new ways to keep people healthy or how to treat chronic disease. This is going to be transformative; we’ve never tried to do anything on this scale. Some studies like this have been pursued in the past — like Framingham, for instance, started in 1948 in Massachusetts. That groundbreaking study enrolled 25,000 people. But Framingham focused just on cardiovascular disease and had nowhere near the diversity of participants or diversity of data that All of Us will achieve. If you had to put your finger on the most groundbreaking NIH initiative that’s about to come out of the gate, it’s All of Us. We’ve enrolled about 12,000 people in the beta test phase and it looks like everything is coming together well. Make no mistake, it’s an enormous challenge to run a project at this scale. Are there any privacy issues associated with the study? Oh, yes, you’d better believe it. And we’d better be sure we get those right — because as excited as I am about this project, a major breach in privacy and confidentiality early on would be an existential moment for this project. So, we have brought together the most rigorous thinkers and experienced leaders when it comes to protection of privacy and confidentiality. Of course, nothing is a 100 percent guarantee and so our participants have to know that. That clear statement will be part of the informed consent process. But we will institute all possible measures for protection: all of the individual information will be de-identified before it gets put into the cloud-based data set that researchers have access to. And researchers — in order to have access — have to make a promise that they are not going to try and find out who these individuals are. When I think about the number of gun and automobile accidents, it seems that has a lot to do with health. Is that a part of your purview or is that outside of your domain? No, it absolutely is a part. We have funded research on gun violence for as long as there’s been NIH, particularly looking at risk factors that connect with guns. For instance, we support research on alcohol abuse and its connection to gun violence. But we also support research on gun violence alone. We are prohibited by law from advocating for gun control. But we can generate data — and that’s what we do. In terms of automobile accidents, actually if you go back and look at the history of how most states now have requirements for driver’s education and learner’s permits, and where parents have to be involved for substantial periods of time, a lot of those policies were based on data from studies that NIH conducted. So, we’re in that space, too. Speaking of automobiles … In a self-driving car, when there’s one accident it makes a headline when there are thousands of accidents with drivers the same day. How do you sort out the way society responds to risk? We at NIH try in our educational role to present this kind of information. We are the number one place that people come to who are looking for credible health information — nih.gov. We try to help people understand what risk means. The idea that you might have a risk of one in a million in your self-driving car is concerning if you happen to be that one, but you probably won’t be. Assessing the meaning of risk is not something we as a society are very good at. Our educational system hasn’t prepared our citizenry very well for this. To be honest, I wish that our high schools would spend a bit less time teaching trigonometry, and a bit more in teaching statistics. I personally have a lot of concern about mathematics and statistics education. These are treated by many schools as skills somehow separate from life issues, when they are actually fundamental to education. Too many people say, “I’m not a math person.” We are missing something here, but that’s another subject. Let’s talk about another type of risk, this time related to the genome and access to the DNA sequence of individuals. If this sequence can be used to predict illness is there a unique privacy issue here? I have thought about that question for a long time. When I first became director of the Genome Institute back in 1993, we tried to envision some of the areas where this science was going to lead to potential ethical and legal issues. And a program called ELSI — the Ethical Legal and Social Implications program of the genome project — was started. I spent a lot of my own time on that. The decision was made to spend 5 percent of the budget of the genome project on ELSI, and that became the largest investment in ethics research in the history of the planet. One of the big concerns is exactly what you’re talking about — genetic discrimination. You don’t get to pick your DNA, therefore it should not be used against you. The biggest concerns were that genetic information might be used against you to take away your health coverage or hurt you chances of being hired or promoted in the workplace. We convened legal experts, social science experts, policy experts — and we talked to the Congress a lot. The first efforts at national legislation were initiated in the mid-1990s. Sometimes it seemed that there was real momentum, but then objections would be heard and we’d have to start over. Finally, in 2008, President George W. Bush signed the Genetic Information Nondiscrimination Act, usually referred to as “GINA.” I was there in the Oval Office. It was a great day. So, what does the Act say? It says, if you, the employer, have access to genetic information about your employee — first of all you are not allowed to ask for it — you may not use it in employment decision or you would be committing a criminal offense. Ditto with health insurance. Your DNA can’t be used against you to deny coverage or to charge you a higher premium than somebody else. Now, one should be clear that GINA doesn’t cover life insurance, it doesn’t cover long-term disability insurance. So there’s still potential discriminatory actions that people should be aware of before they decide to make their DNA available to just anybody. In using the DNA sequence, how does this help in diagnosing characteristics of the preborn? Let me step back to present some data before I try to answer your question. What do we know about the role of genetics of male homosexuality? When we want to understand how much of a particular human behavior is hereditary, and how much is learned, we often start with those experiments of nature called identical twins. Identical twins have exactly the same DNA. So if some characteristic is purely genetic, the twins would be 100 percent concordant. But for sexual orientation, they’re not. So what’s the actual data? If one male twin is exclusively homosexual, what’s the chance the other one will be? It’s about 20 percent. It’s not 100 percent, but it’s not 3 or 4 percent, which is roughly the population frequency. If you look at fraternal twins, who share environment, even in the womb, concordance is way less than 20 percent. That says there are clearly some genetic factors involved in male sexual orientation, but they are predisposing, not predetermining. Another interesting fact, which I don’t know how to explain, is that the chance of being a male homosexual goes up with each older brother that you have had. That’s been confirmed in multiple studies. And nobody really understands the mechanism. Another potential use of the DNA is to actually design future offspring. What is your thinking there? Many people watching what’s happening in human biotechnology are concerned: Are we slipping into an actual possibility of designer babies, where parents are going to decide how to optimize their offspring using the tools of genetics? Well, those concerns are probably premature. Scientifically this approach just wouldn’t work very well. What do parents want to optimize for? Intelligence? Athletic ability? Oh, my. These are all incredibly complicated genetic issues, and the environment plays a huge role. Using DNA technology to allow a couple to pick their most favorite genetic outcome, from the DNA they bring to the occasion, will have very little effect on things like intelligence. What those parents decide to do as far as educating their children and giving them life experiences will weigh much more significantly. But there are new developments on the horizon. It might be possible for a couple not just to look at how the dice were thrown and decide whether they like the result, but actually to load the dice. And that’s what is presented, at least theoretically, with this new development called gene editing. So how does this work? We have these new amazing capabilities, and arising out of one of the least expected areas of basic science, to be able to change the DNA instruction book in very precise ways. This depends on an enzyme system something called CRISPR-Cas. It works on cells from all different species. Lots of labs, including my own, use this on cells growing in a culture. It’s phenomenally efficient. And there’s no technical reason you couldn’t make that work with a human embryo. Why not then if you want to have a child with certain characteristics? Start with in vitro fertilization (IVF); the embryos will be in front of you at that point. Then add or subtract some things that would never have happened in a natural child of yours — but maybe you can make them better. It’s still not easy to see exactly what you would do that would have a purely positive effect, because everything is connected to everything else. But there are certainly people talking about that, and maybe in China they could even be thinking about doing that. In this country, the National Academy of Sciences issued a long-awaited report last summer that basically said we shouldn’t be doing that for enhancement purposes — but they left the door open a little crack. I was surprised at that, because I think this is one of those truly dangerous circumstances that would betray a level of hubris that is potentially breathtaking in its scope. Do we really think we know enough about human biology to improve it? Do we really think we know what it means to be human? Are we ready to proceed to make a change in that basic construction of a human being, which would be passed on to future generations — none of whom gave consent for any of this? But one thing we can’t do is to argue the point by saying, “We should never do things that would enhance normal functioning.” We do that all the time. What do you think vaccines do? Piano lessons? Hair coloring? I mean, come on. We apparently have gotten over our concerns about those kinds of enhancements a long time ago. But there is a certain type of enhancement, which alters the genome, and thus alters the fundamental biology of that individual and their future offspring — that seems different to me. Maybe you could say just a bit about the partnerships you have. I think about the Bill and Melinda Gates Foundation, what they’re doing with malaria and I think about businesses who say, “Health care cost is a huge part of my expense.” Are there any partnerships that address those kinds of issues? Well, the Bill and Melinda Gates Foundation is one of our major partners. Between NIH and the Gates Foundation, that is about 60 percent of the entire world’s investment in global health research. So Bill and I have worked really hard over the last four years to make sure that we’re in synchrony about what we’re doing. Once a year he brings his entire senior staff to NIH, and for a day, we review all of the research topics, whether it’s HIV/AIDS or malaria or TB or maternal and child health or neglected tropical diseases or point of care diagnostics — all of these things that we all care about — and we make sure we are working together and anticipating all of the ways to make more progress. We have set up joint working groups in all of those areas that work throughout the year, making sure that we’re completely complementary in what we’re doing. It’s not that the Gates Foundation does the same thing that we do, because they’re more focused on implementation, “Get it out there, get it to work.” And we’re more focused on making sure you have the evidence to know what should be implemented. But that’s a good pair off. This one’s tightly organized, and Bill and I have, I think, been pretty good partners. With the private sector, we have not worked much with companies that are worried about their health care costs. We work more commonly, because we’re a research organization, with how we can jointly be more efficient. We look for opportunities where there’s a shared need — where industry can’t quite do it by themselves and we can’t do it by ourselves, but we could get a lot done together. As I mentioned earlier, we’re doing that right now with opioids. That discussion resulted in what is an unprecedented public-private partnership called AMP, the Accelerating Medicines Partnership. Ten companies agreed to work with NIH in an intense scientific team effort. We identified three areas to work on: type 2 diabetes (the adult type); Alzheimer’s disease; and autoimmune diseases (rheumatoid arthritis and lupus). We assembled teams with leadership from both industry and academia. I agree to serve as the co-chair of the executive committee. We designed work plans that include specific time tables and deliverables. This is not just playing in a lab, this has got to get stuff done. Those 10 companies agreed to pay 50 percent of the cost of the partnership, because it was worth it to them. Don’t get me wrong, I still think the competitive market is critical for ultimate public benefit. Once projects like AMP run their course and provide a foundation of information about the basic nature of a disease, then we then let the companies go do their competitive thing and develop that next product. But right now the basic fundamentals still need a lot of work. You mentioned cost and cost sharing, but what about the end-product cost? Because that affects the consumer’s ability to actually use these products. Everybody agrees we have a problem in the U.S. with drug pricing. Emerging treatments with drugs and cell therapies for cancer, hepatitis, and rare diseases are incredibly exciting, but many of them cost hundreds of thousands of dollars. I heard about a drug recently where one dose cost about $450,000. That would likely be one of these cancer immunotherapies. Let’s be clear, if that cures someone with metastatic cancer who would otherwise rack up hundreds of thousands of medical bills and still die in a few months, we should celebrate the fact that the paradigm is changing. But cost is an issue. Unfortunately, NIH doesn’t have levers to pull in that space. We don’t set prices, even in situations where our investigators had a hand in the early stages of research that led to the product. We tried 20 years ago to require that any company that collaborated with NIH on something that resulted in a product would have to talk to us about the reasonable pricing of that product. Suddenly, no companies wanted to work with NIH. How could NIH contribute in some ways to the solution to this problem? And I just said, “Well, senator, let me walk you through what the options are, and why we don’t seem to have the control over them.” In my view, although it seems politically almost impossible to get off the ground, the government is one of the major purchasers of drugs. If the government were permitted to do price negotiations, probably a lot of those prices could come down — but that’s not a popular idea. The other thing we can do is to make the process of drug development more efficient. One of the reasons why drugs are so costly is that almost all of the drug development programs fail. More than 95 percent never make it to a product, and all that has to be written off by the company. The part of NIH called NCATS (mentioned earlier) has its focus to figure out how to make drug development more efficient. Pick the right target, for starters. Then pick the right molecule that hits that target. Do your tests for safety and efficacy — even before you go to a human patient — really quickly and really accurately. And then when you get to those Phases 1, 2, or 3 trials, pick your patients carefully so you get the maximum information. All of those steps have not really been optimized in a systematic way. No company is going to do that by themselves, but NIH could do that. And I think we’re making some headway there. If efficiency goes up, companies will have less of a reason to charge exorbitant prices. Sometimes, I’m sure you have personal beliefs and standards that come in to conflict with what you do. How do you navigate this? It doesn’t happen often. I surround myself with deeply thoughtful people about social, legal, and ethical issues. There’s a whole bioethics community that I know quite well and that I call upon when we’re trying to decide something important. That can involve a wide range of questions, such as: Is creating human-animal chimeras for transplantation ethical? Should we stop supporting invasive research on chimpanzees? And most of the time, I find that where I come to as a Christian is very much in synchrony with a professional bioethicist, who may not have the same world view that I do. But ethicists tend to follow those same Judeo-Christian principles: benevolence, non-malevolence, justice, equity, autonomy. In difficult situations, sometimes those principles are in conflict with each other and you have to decide how to apply the weighting factors. Where it gets particularly difficult is when it comes down to the sanctity of human life. My worldview means that I’m going to raise major objections to human embryo editing with the purpose of creating modified human beings. Others from a more secular perspective may see that as at least a defensible approach in special circumstances. If you add a political agenda, which may conflict with an ethical agenda from one person’s point of view, and a scientific agenda, does that complicate the mix? Whatever the issue, when you throw politics into it, it inevitably gets worse. Because then people are likely to adopt hardened positions — especially now — oftentimes without fully appreciating the scientific facts of the matter. The whole debate about human embryonic stem cell research is a case in point. Most of those discussions are chaotic and confusing. Strong positions are stated from various perspectives, without taking the time for a much-needed deep dive into the scientific facts. That can get frustrating. But maybe that’s a role that I can help play. People know that I am somebody for whom faith is important. It’s the rock on which I stand. And if I can contribute to a conversation about sensitive ethical issues with the faith community, who might otherwise believe science is out of control and dangerous, maybe I can help. What would you advise for young people today? What have you learned from your own career that would be helpful to someone else? For starters, I would advise a young person to be flexible and open to opportunity. What they should not do is to plan their career out at the beginning and be confident that that’s going to be the path that they will follow. That’s what I tried to do. The first science I fell in love with was chemistry, so I figured, “I’m going to be a chemist.” I ignored biology all the way through the rest of high school and college. My undergraduate degree is in chemistry and I got a PhD in physical chemistry. It was the first area of science that I really enjoyed. But then I discovered, well into graduate training, that biology was even more interesting — and I had missed that. I totally changed direction and went to medical school to try not just to study biology as a laboratory science but as a human endeavor. And I fell in love with the combination of genetics and medicine along the way. None of these experiences were wasted, but my path certainly wasn’t very efficient. And then there was the matter of faith, which I had mostly avoided thinking about during college and graduate school. But in medical school, I came face to face with those issues of life and death, which you have to wrestle with when you’re sitting at the bedside of people who are dying. That experience caused me to explore the evidence for belief in God, and ultimately, to my great surprise, to become a Christian. None of that — in my wildest dreams — would’ve been part of my trajectory when I entered college at age 16. I would say to any young person who’s trying to plan their future, keep your options open. Watch for those doors that open that you didn’t expect. Don’t be too upset about the ones that close, even if one of those was your heart’s desire, because maybe it wasn’t after all. Don’t narrow your horizons. Keep your interests as broad as you can. Be voracious in learning and reading and soaking up everything that there is to absorb in an incredibly exciting time in science. And be prepared that you’re going to have multiple careers as you go forward. You will learn something from every one of them — even though sometimes it will seem like, “But why did I do that?” There’s always a reason. I’m glad I had the chance to do everything I did. And I don’t think I’m done yet. Does Dr. Collins rule out any possibility for practical, real time, human to human, brain chemistry communication, because a spiritual component is required?